UF’s Concrete Canoe team is back from Colorado where they secured second place at the national competition hosted by the American Society of Civil Engineers. The UF team scored high marks in every competition, including first place in the final product and in the co-ed sprint race, which earned them the R. John Craig Award, named after the engineer who originally inspired the competition. The UF team has placed in the top five at the Concrete Canoe national competition for seven of the last 11 years, with a first-place finish in 2015 that earned them the distinction of being the first university to ever win both the concrete canoe and steel bridge competitions in the same year. So Close! UF finished second behind California Polytechnic State University this year. It was the closest point differential between 1st and 2nd place in the 30-year history of the competition. The Concrete Canoe competition engages civil engineering students and prepares them for involvement in the civil engineering community. Participants enjoy hands-on experience with a design team, and mentorship from professors and sponsors. Next year’s 2018 ASCE Southeast Student Conference will be held at UF, bringing 1,200 students and faculty from 26 universities to the Gainesville campus. 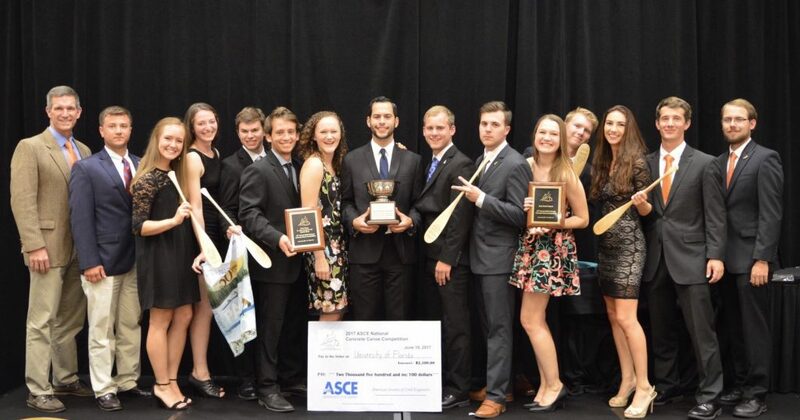 Founded in 1852, ASCE is an international network of civil engineers and the oldest national professional engineering society in the United States. Chartered in 1968, the UF student chapter is one of the largest student chapters with over 120 active members.